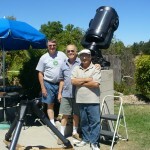 I started out in amateur astronomer as a kid interested in building my own telescope. 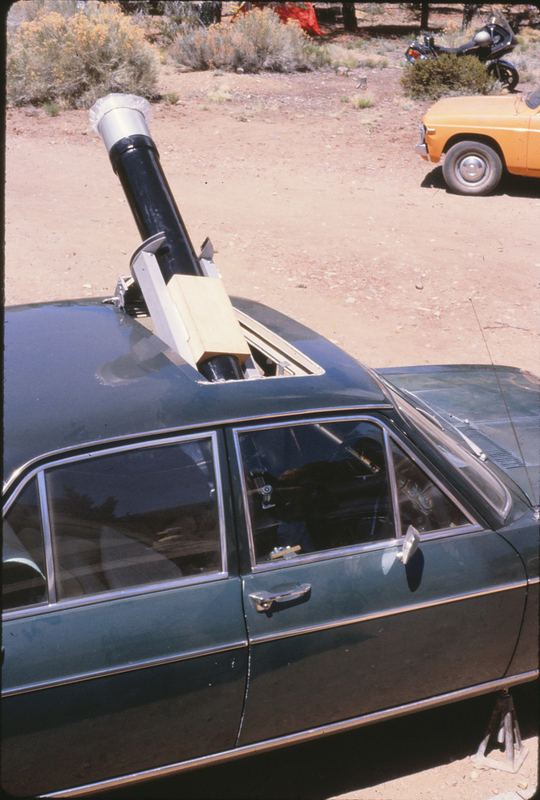 At that time, that was the way most amateurs got their scopes, especially if you were too poor to buy one. My first telescope came from the advertisement pages of Popular Mechanics magazine, when I was 10 or 11 years old, in 1949. It was two plastic lenses, for two dollars, which I stuck in the ends of a cardboard tube. I could see the rings of Saturn–better than Galileo could! I was hooked. There was a group working on mirrors in the basement of Griffith Observatory which I attended once or twice when I was at Berendo Jr. High. I don’t think I followed through with that group, as Mother moved a lot. However, I purchased Allyn Thompson’s Making Your Own Telescope. For the next several years I dreamed about and worked on that project, grinding and polishing my own 8 inch mirror. I decided to build a fiberglass tube for it. What a mess! I was in Whittier, next to a refinery. You couldn’t see a star in the sky. I tried to find a star with my home made telescope. Instead, I pushed my eyepiece through the telescope, and heard it hit the glass. Kerplunk! My heart sunk. I had it professionally refigured and aluminized again. But I don’t think I ever had it in a telescope that I could see a star with it. 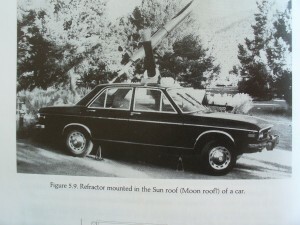 My mirror making career was a failure, but I was determined to make my own telescope. Finally, I bought a 13″ Odyssey Dobsonion which had glorious views. 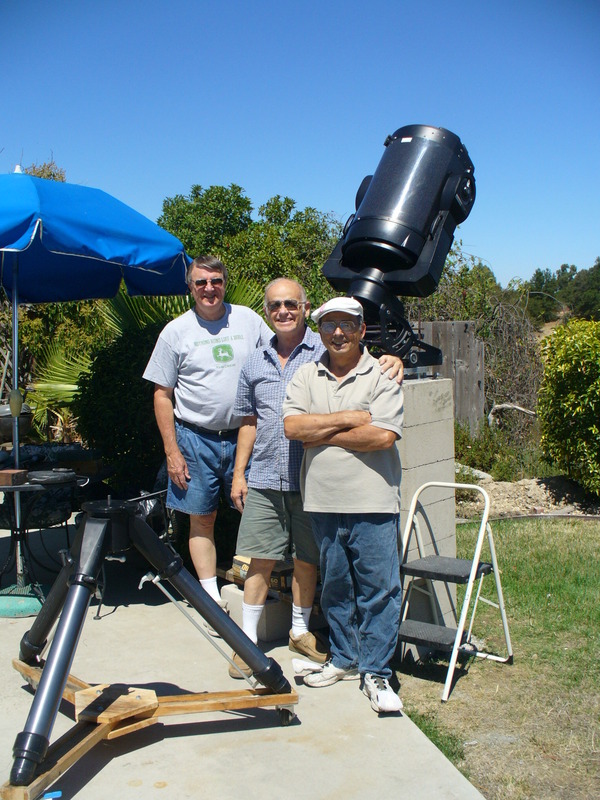 Prisoners at Soledad later helped me machine a unique telescope mount for my ill-fated fiberglassed/homemade mirror telescope. This unique one armed fork mount was the first of its type, and won a prize at the Riverside Telescope Makers conference. But I never really tried the optics in it. Not having learned to avoid fiberglass, I made a black one, for a Jaegers 6″ objective. This ridiculous telescope ended up being published in Peter Manly’s book Unusual Telescopes (1991, Cambridge University Press). 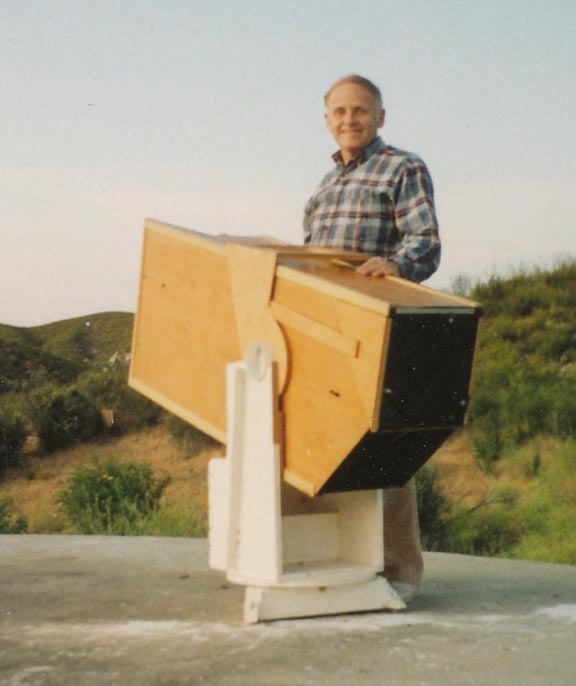 About the same year as that picture was published, I received a patent on the telescope that I am most proud of, my Newtonian Binocular telescope, which is a revision of Sir John Herschell’s (son of William Herschell) invention. 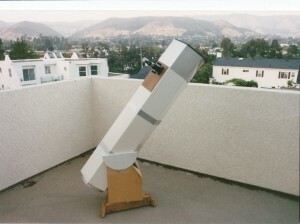 It is two Newtonian telescopes put together in such a way as to allow the viewer to comfortably view the sky as he/she would with a regular Newtonian. 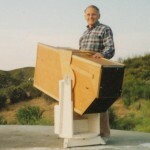 The modification was in the configuration which allowed comfortable access to Zenith regions of the sky, which was not possible with Sir John Herschell’s telescope. [See Patentedbinoscope.jpg] This won an RTMC award as well. It was covered in Astronomy Magazine, as one of the finest views of the sky for that year (1991). It was very portable for a large (10″) binocular. During the same period, I built a telescope out of foam board. It was one of the easiest to use and most portable. I think it was the first telescope I ever saw made out of this material. Tom Frey recalls the time we took it to RTMC, and I accidentally broke off the secondary spider while travelling in his van during a stop. While travelling the back roads–at night–I was in the back of the bouncing van taping it back together. When we got to RTMC, I pulled it out of the van, and pointed it at the stars. They were pinpoints of light! Tom was floored. He has never forgotten that experience. 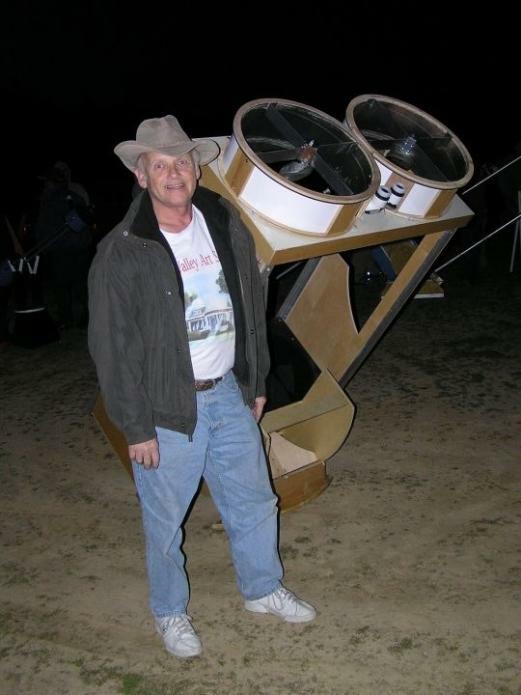 My last homemade telescope was a giant 17.5″ binocular, which I managed to get to a viewing at the Monthly star party. The view of Lagoon Nebula through it was fabulous. My Wife, Pat, suggested that I clean up the garage of my telescope making stuff, and buy a nice high tech scope. I only heard “buy a nice high tech telescope.” I found an RCX 400 and later built a pier. Lee and my neighbor, Jim, helped me place it on the pier. I now remotely control it from the house, and have enjoyed the honor of doing some actual exoplanet research with it, with Tom Smith, Russ Genet, Jolyon Johnson. I cover the scope with a telescope cover and with the umbrella shown in the background. I prefer this arrangement to a shed, to lessen the daytime heat. Also, the view is not obstructed by a building. My story is one of many failures, with a few successes. But I think my boyhood experience with the $2 lenses and cardboard tube is what hooked me.